The Southgate Light Railway was officially opened in June this year (2015) after 17 months of building work. However, before the official opening, plans were already afoot to add an extension. The SLR’s layout is quite unusual as it was decided early on it needed to be raised up, adding to this was the very limited space which meant a circuit was out of the question. The basic plan was a U shape track which would split levels at one side. 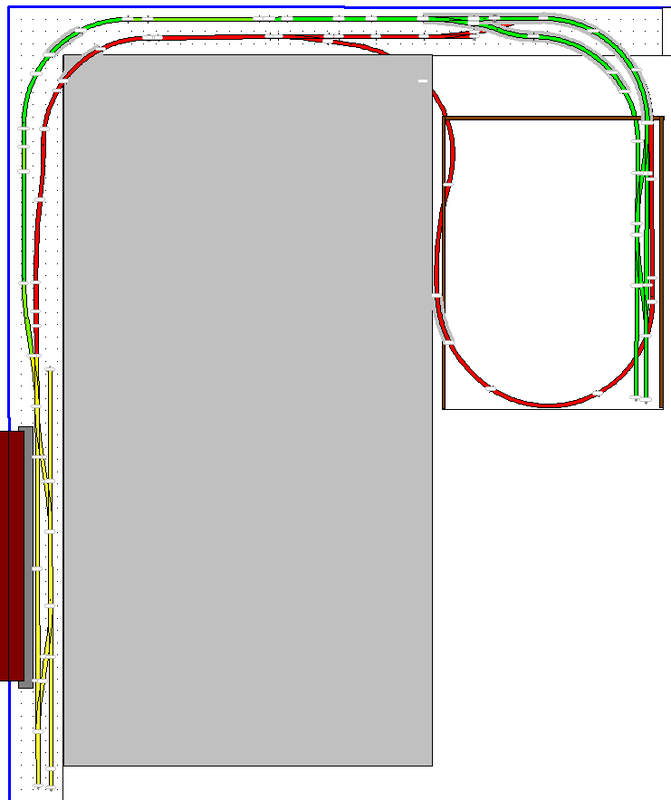 This was the original layout diagram created in SCARM, the software doesn’t support the correct Peco radius so ignore the fact it doesn’t stay within the shed. 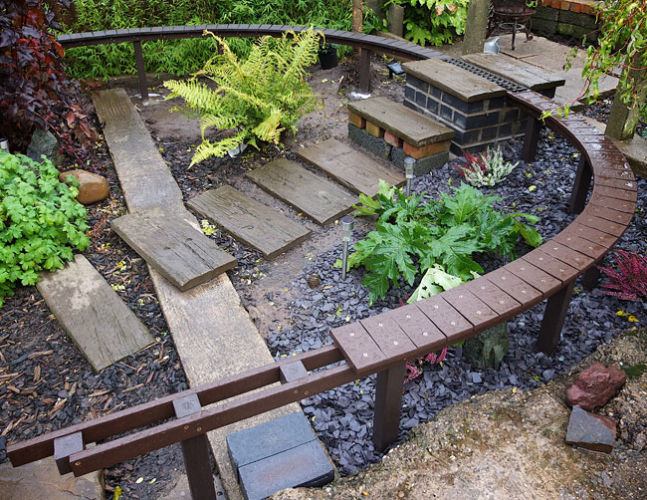 The overall size of the garden is around 6m x 5m, so fitting everything in was always going to be tight. As you can see, we currently run either end to end or around the loop and back. This presented a problem when interest in building a coal fired loco developed, which ideally requires continuous running. The next image shows the proposed location of the loop at the rear of the drive. 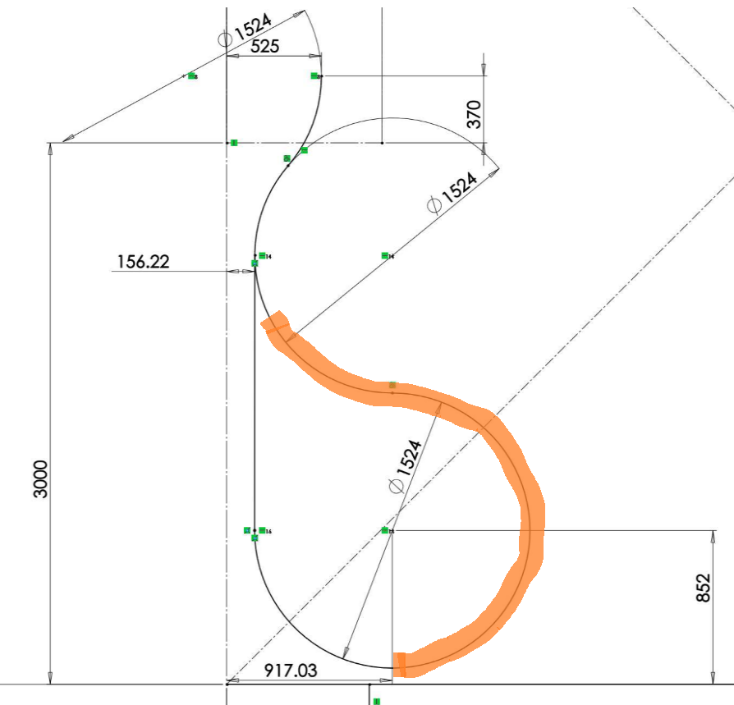 This would require a section creating which was around 1.2 meters high and large enough for a full loop. Add to this the fact I bought a larger car than I maybe should have done and we have our next problem. How do I sell my fiance’s car? No, we’ll have to create a removable loop. 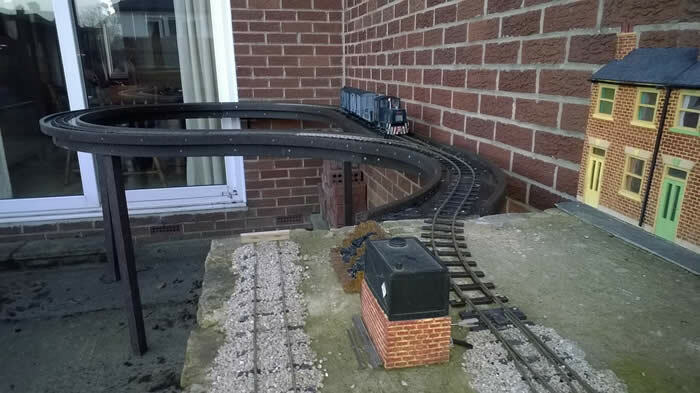 The answer was to have one fixed section along the back of the drive to take the railway across to the house, then start the loop before moving on to a removable section to complete it. The following diagram was created with the help of a friend and his CAD software. The highlighted orange section will be removable to allow the car to be backed in. The radius of this will be 30” as I’m using Peco SL-605 set track. I already have some 30” curves so this small radius wasn’t an issue. One solution, but another problem. What do I make this out of? 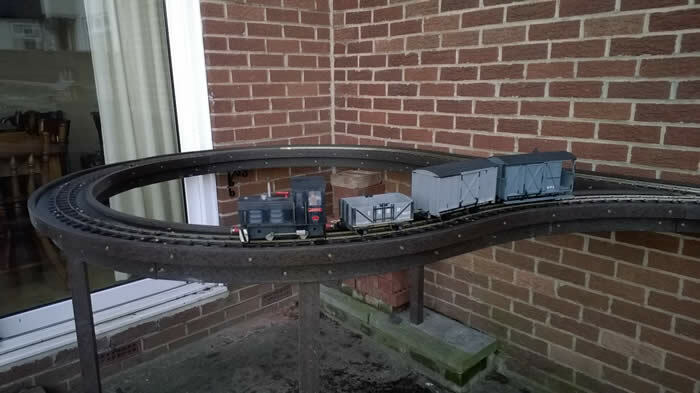 I’ve made multiple bridges for the railway using mild steel and arc welded them together. However, limited bending tools means this may be a stretch too far for such a large extension and weight would become an issue. Pre-bent aluminium was considered next, but finding a company able to bend it was difficult so that idea was scrapped. It wasn’t until I spent an afternoon googling 16mm bridges that I came across this company, Filcris. 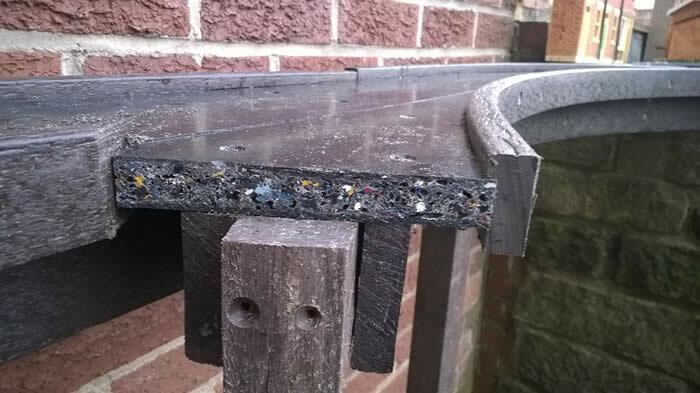 I’d seen them at a show once before, offering recycled plastic track beds. For my project, they offered a ladder frame system which looks perfect. After talking with Chris, the company director, some stock was ordered. 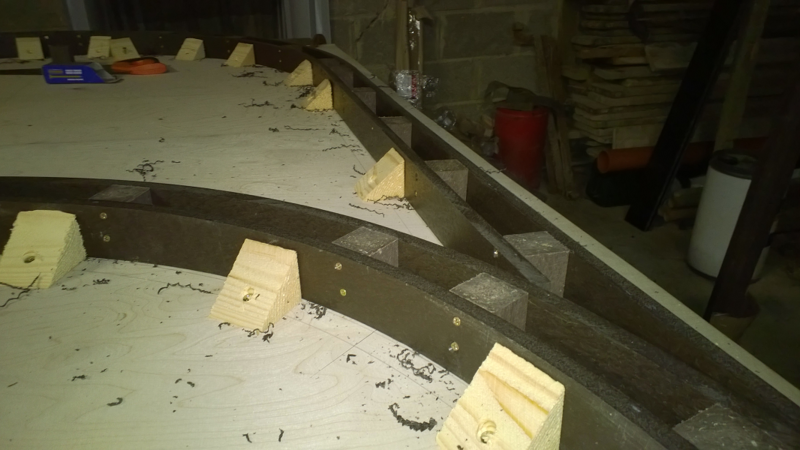 First, we needed to create a jig to form the ladder sections, due to the tight curves. 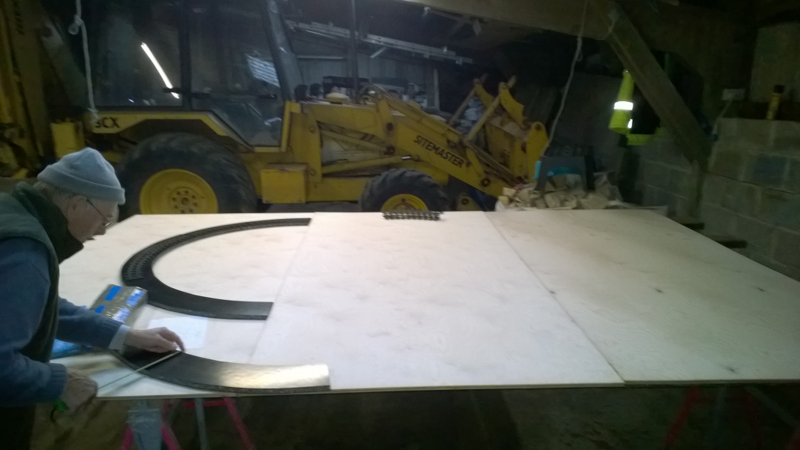 This required three 8 x 4 foot plywood sheets laid on trestles and planks, and a large shed to work in due to the weather. Luckily my father could provide everything needed. 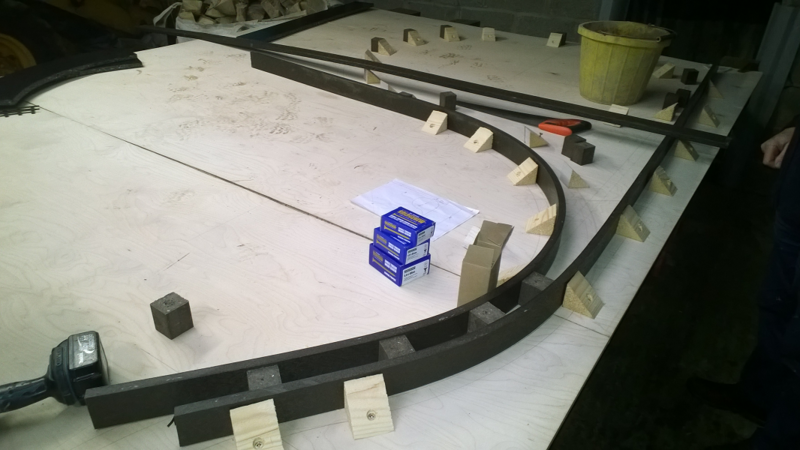 The above plan was then drawn out, with lines for each rail and for the curved board sections (Again supplied by Filcris). We placed the boards on top to see how it looked, and to check we had enough (We did, one straight section is not shown). Next, we planned out the locations for the spacer blocks and the posts, after all this is going to be around 1.2 meters off the ground. The above shows the joint of the removable section near the point. We wanted to have a spacer block at each side of the post to give it strength, one of these blocks will span the joint. 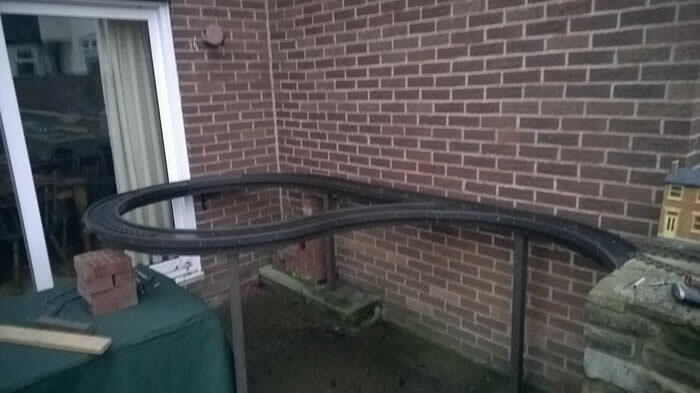 The idea was to build the loop as a whole, then cut the removable section out once everything’s fixed. This should mean the radius is kept. The block on the joint line will be removed before cutting, and replaced to provide support for the removable section. 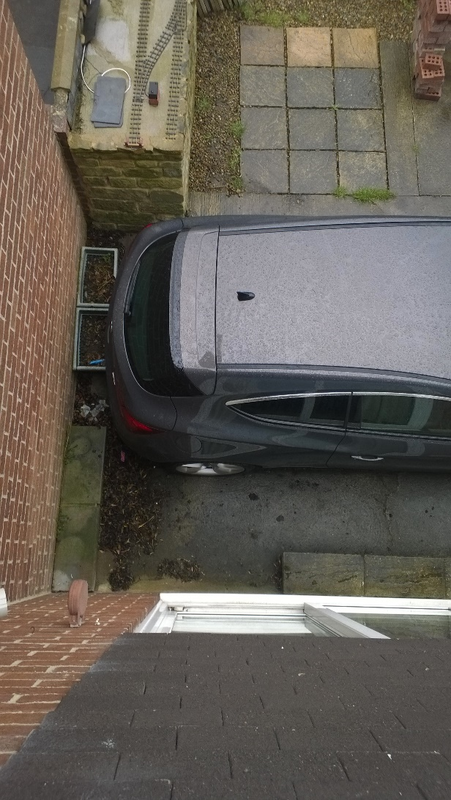 A bolt would be used to stop the gap opening up. The far right block will just keep the sides of the removable section together when removed. Armed with a job lot of blocks we could start to bend the side frames. 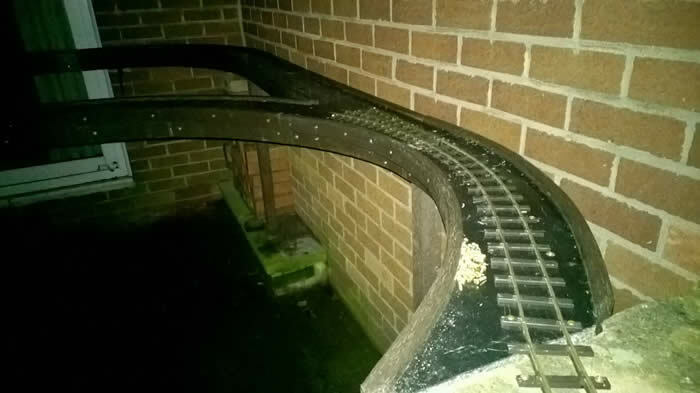 We used five 3m lengths of frame, making sure not to join each end at the same point and always on two blocks.Here you can see the blocks in place, and how we joined the loop up. 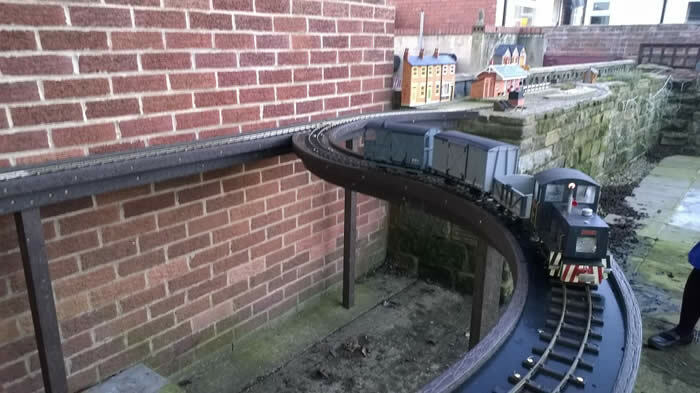 The outside of the loop carries on towards the wall and station for strength. 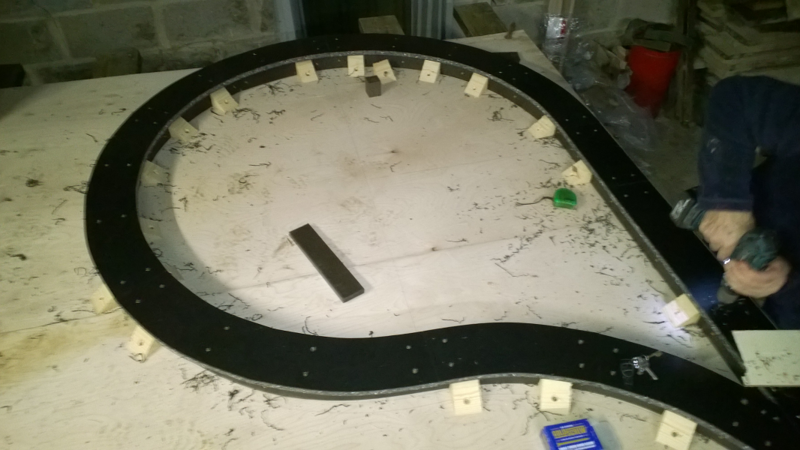 Next we fixed the top track boards on, to make sure the screws holes were in the right place a template was made. Soon we had the whole section completed, filled in some gaps with more screws and readied ourselves to make the two cuts. 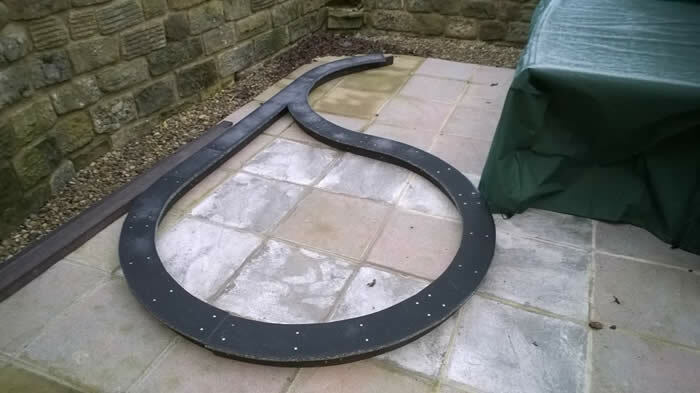 We cut the two joins to create the removable section and transported the sections to the SLR for test fitting. 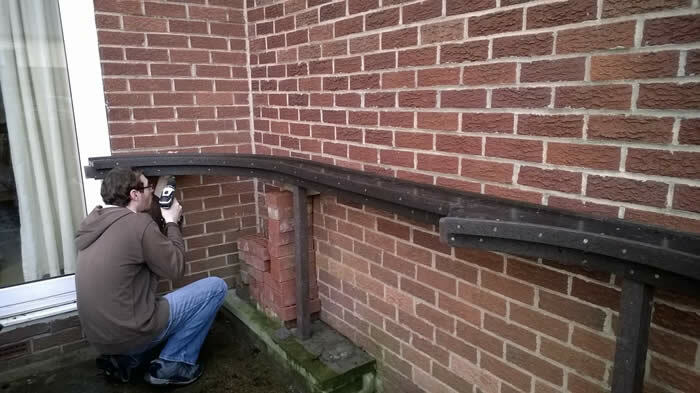 We then fitted the rear section in, cutting the required post and create a good joint to the station wall. Next we put the removable section in place, but didn’t cut the legs just yet as these couldn’t be adjusted by the fixing at the top. We wanted to cover up the top board sides as there interesting to look at but don’t give a very good finish. 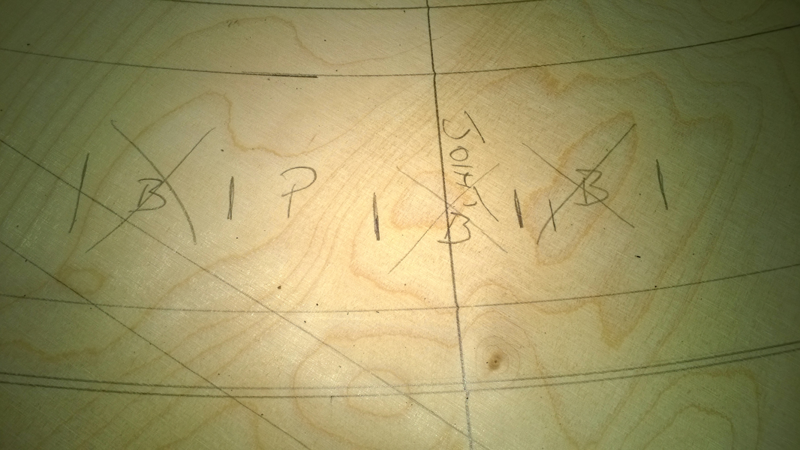 We ordered some more lengths of frames from Filcris and cut them down so only 10mm stuck up above the boards. This was really the second plan, as the first had them higher but as the boards are only 140mm wide it didn’t offer enough clearance. Long term I’ll look to install some fencing on the outside edge of the side frames so stock and loco’s can't easily fall off. A grove was cut in the frames so they fit on to the board at the correct height and gave a good finish on the inside edge. The removable section was put in place with the legs cut to length. What I haven’t shown is the number of times this was removed and re-installed. A lot of sanding and tweaking was needed to get everything to line up. Sorry for the quality of the photo, it was getting dark. The removable section is held in place by two large bolts which go in to the blocks stuck out on the rear section. A wing nut is then installed underneath, its petty quick to remove. 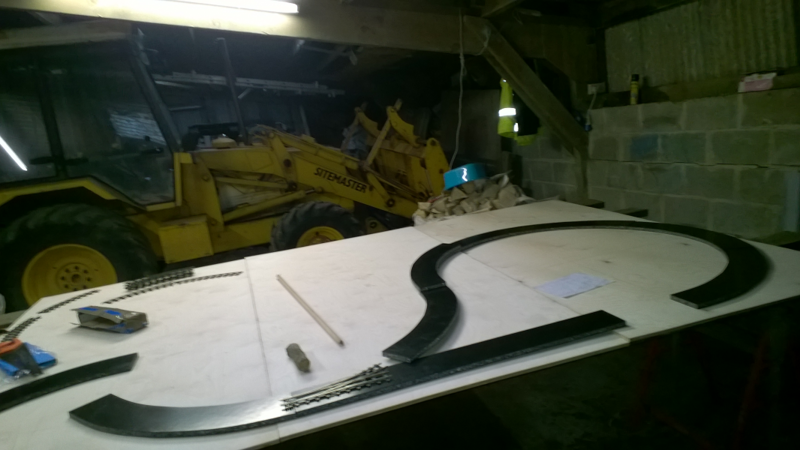 Now came the track laying, first we removed a short section from the station. I’d already had the forethought to ballast this section. 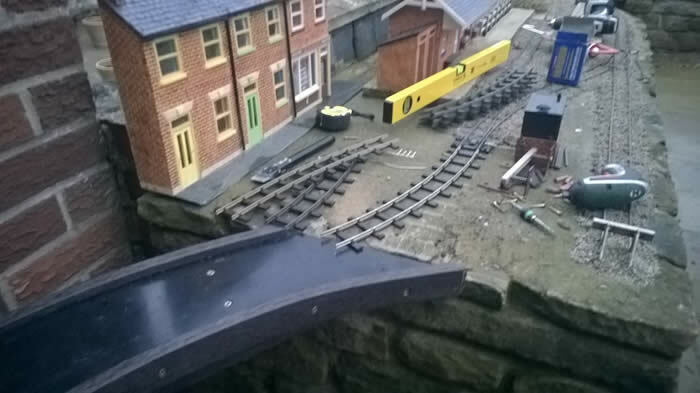 Some set track and flexi was then used to connect up the new point. As you can see, it got very dark so with the lovely smell of tea being prepared I headed indoors. The next day work continued. 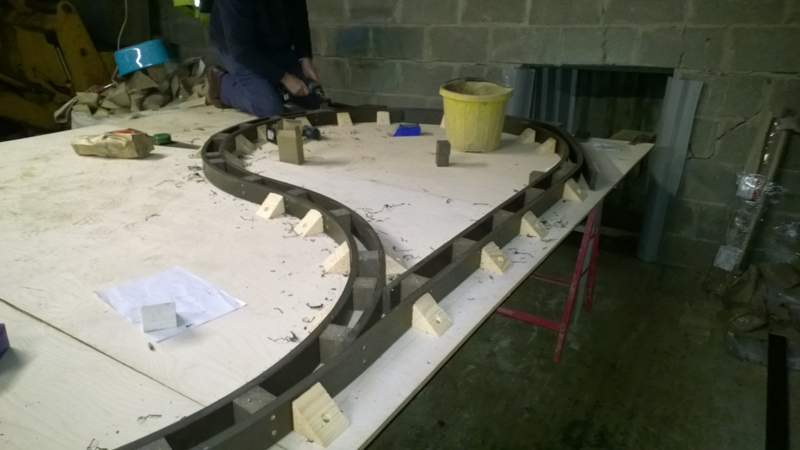 Laying set track around the loop to complete the extension. I didn’t take any pictures of this as its just set track screwed down with brass screws. 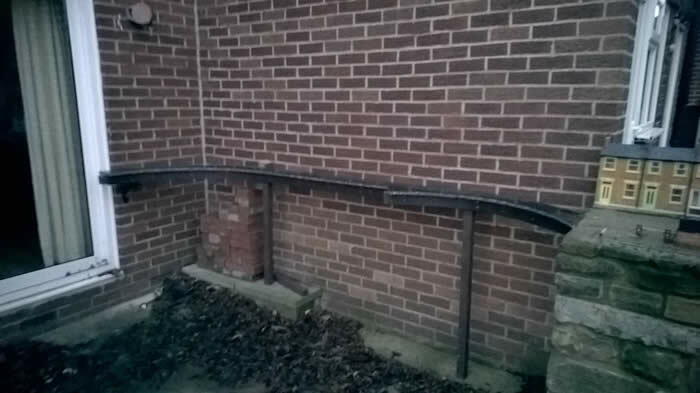 I made sure I had sleepers need the joints at both sides so the rails couldn’t get out of line. All that was left to do was test. Our trusty diesel loco was put in to action for the first trip around. As the light faded we managed to run both steam locos around the loop and enjoyed been able to run for longer without having to shunt. The extension also improves our chance of operating an open day but a little more testing and work might be needed before we do that. 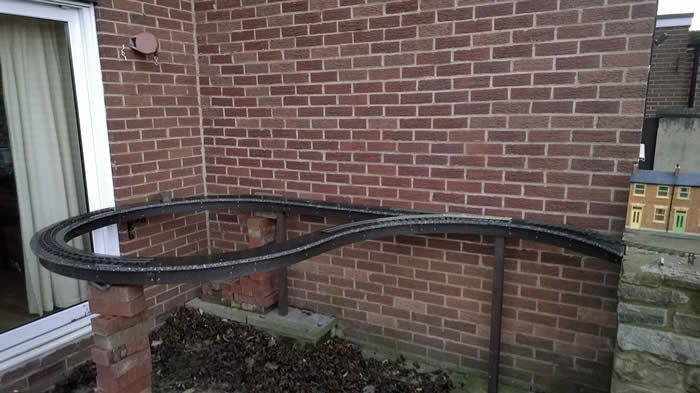 Come Spring I’ll ballast the loop to match the rest of the railway, using the SBR method of secure it down which has worked very well so far. Hope this helps anyone with a similar idea or using the Filcris plastic products in a new way.